Come visit us June 18th, at our annual open house at the North Coast Seed Studios building. This year marks the 20th anniversary of this event and we will be celebrating it with a bang! 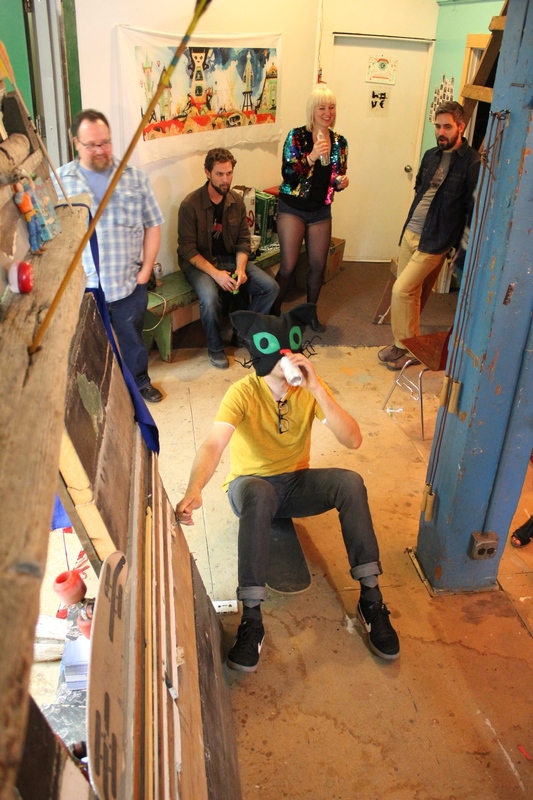 Over 40 artists of various mediums will be opening up their studios throughout our studio building. Come see our work spaces and meet us! In the ACTION space, we'll have refreshments, a raffle, and a little shop with prints, art products, gifts, and some original work for sale. It's always a fun time. See you there! Stephanie Buer's two-person art show After (alongside Seattle artist, Mary Iverson) opened this past month at Thinkspace Gallery. 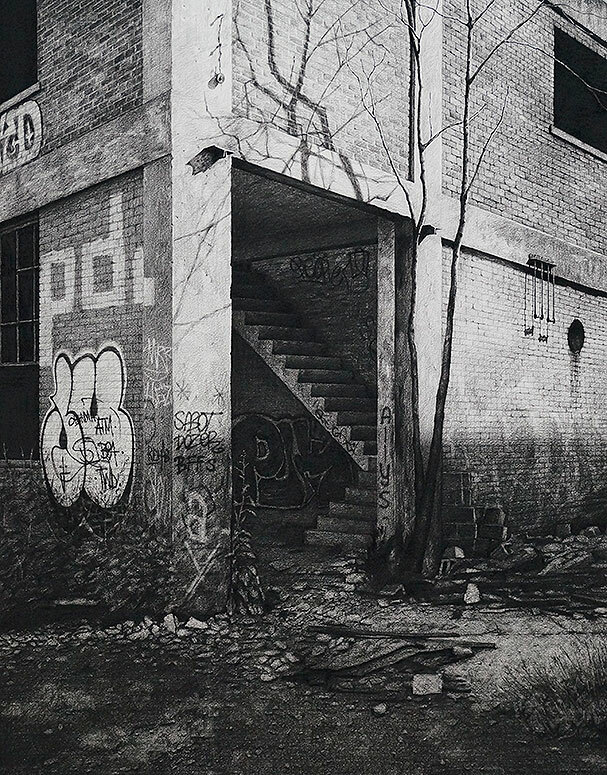 Stephanie created beautifully rendered oil paintings and charcoal drawings of wintery Detroit for the exhibit, including a massive 5-foot charcoal drawing of a factory-turned-dump site titled Lazy Boy. Stephanie is a native of Michigan and was an accomplished ballet dancer before studying art at The College for Creative Studies in Detroit. Her professors discouraged her from pursuing fine art, so she chose a more stable job working for GM as a sculptor of car prototypes after graduation. When she moved to Portland she decided to follow her dreams and started exhibiting her work. She has shown her work in Portland, Los Angeles, New York, Miami, and Honolulu. In her spare time, Stephanie mountain climbs with her husband Eric and has scaled Mt. Rainer, Mt. Baker, Mt. Hood, Mt. Adams, and Mount St. Helens in the Pacific NW. She also made a trip to Africa earlier this year to climb Mt. Kilimanjaro! See photos of the exhibit and opening below. Last weekend we went on our first ACTION group camping trip! 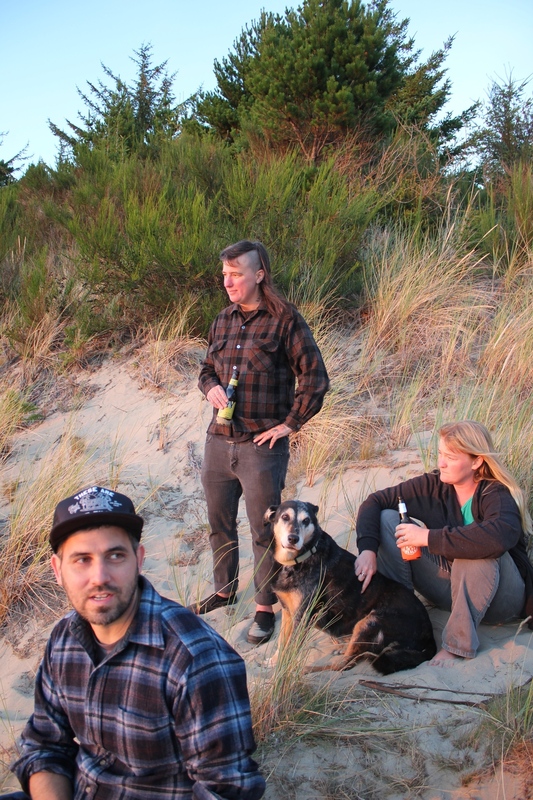 We drove 3.5 hours south to the beautiful Oregon Dunes and spent the weekend sharing meals, making hobo-pies, hiking, swimming, beach-combing, telling stories around the campfire, and running barefoot on the spotless dunes. That weekend was also a supermoon and on our second night we all ventured out to the largest dune by moonlight (we nicknamed it the Moon Dune), ran around on its smooth, cool sand until we were out of breath, and laughed around the bonfire. We stayed there until the mist rolled in and we ran back to camp chilly; covered in morning dew. Hopefully this will be the first of many annual camping trips together. Our studio-mate Justin "Scrappers" Morrison released the new Summer issue of Stay Wild Magazine a couple weeks ago at Snow Peak in downtown Portland. He and his awesome little family are driving up to Victoria, Canada this weekend and will be distributing magazines all along the way. Keep an eye out for your copy! ACTION participated in our first annual North Coast Seed Studios open house on Saturday. It was very well attended and the event coordinators said over 1000 people came through the building to browse the studios! We got a lot of wonderful feedback and people seemed very enthusiastic about our space. We are so used to just the nine of us in the studio; it was nice to have fresh eyes seeing it for the first time and telling us what they thought of both the space and our artwork. Looking forward to next year's event! Brin Levinson's solo show Silent Empire opened at Hellion Gallery last month. It's been a pleasure watching him create the artwork over the past year. I had seen a little bit of Brin's work before we became studio-mates at ACTION, but it was a whole other experience to see every piece as it was in progress, completed, and finally hung together as a body of work at his show. Brin's paintings often depict magnificent animals amidst urban decay. The paintings are bittersweet... the human world is in a shambles, and yet there is a beauty in how nature endures nonetheless. Many of the places Brin painted in Silent Empire are locations around Portland. As a local viewer they put you in a familiar place, but utterly alone, surrounded by an eerie glow that you can't distinguish between dawn or dusk. They're haunting and beautiful all at once. Brin's show is no longer on view at the gallery, but he will have a handful of original works and some prints at our studio open house later this month. In the meantime, please enjoy images of his work from Silent Empire below! In a few weeks ACTION Studios will be opening its doors for the annual open house at the North Coast Seed Building. We moved in last August, so this will be our first time participating; we've heard it is quite the event! We'll have original art, prints, and other art products available and Stay Wild will have free Spring issues of the magazine as well. Come by to see our space, chat, and check out some of our talented neighbors too.